My friend Ada and I also went to a dessert bar last Friday. It's called Chikalicious, but chicken is not on the menu. Apparently, it's a name made with the chef's name (Chika) and the word delicious. 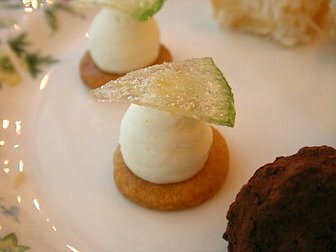 For $12, you are served an amuse (like an dessert appetizer), the actual dessert (which you get to pick), and some petit fours. Our amuse was honey parfait in a pear soup. This was good, since I really love pear. But the other table got the same parfait with cranberry soup. I thought it would be better with cranberry since the tartness would cut into the honey sweetness. My dessert was almond cake, toasted almond ice cream, and apricots cooked in amaretto. I guess I have been using almond extract for too long. I had forgotten the real almond essence is derived from the variety of bitter almonds, which really has a discernable taste from just almond extract. Ada had a molten chocolate tart served with pink peppercorn ice cream. Mmmmm, so good!!! And in the picture we were served the petit fours -- coconut coated marshmellow in the background, truffles made with some liqueuor aged for 8 years; and this cuter than cute little thing decorated with a piece of candied lime piece. The place was tiny, with ~8-10 bar stools and 3 tables. Sitting at the bar would give you a nice view of the crew working. We were lucky that we went at ~3, because after I came back and did some internet search, I found this place to be extremely popular and often with long lines at night. I guess rent would be too expensive for a bigger place, and their insistence on quality must also be a factor too. Ada and I both thought it's a more refined version of finale. Chikalicious -- it's delicious and pleasing to the eye! i've heard SO MUCH about this place from all of my nyc friends. i have to try it some day. glad to know that it does live up to the hype. John: I liked Finale...but I guess the dessert was ordinary. I liked their sorbets a lot. And I liked the atmosphere. Chickalicious is more sophisticated, and the desserts more imaginative. Charles: just make sure you go in the afternoon -- maybe during your spring break. They open at 3pm i think. I saw some pictures on the web with like 10-15 people waiting outside the door. It's not only annoying to wait, but also annoying to have people waiting for your seats. When I went in the afternoon it was very empty and quiet. Good food should be enjoyed at one's leisure, not rushed. No this one didn't have any fire. The decor was all white. There was no way they could have fitted it with a fireplace. yeah it reminds me some of the tea houses in asia...we just sat there and chatted over tea and snacks. It was a fun time!